US fast food chain Jack in the Box is considering swapping some cashiers with self-ordering kiosks and other tech as minimum wages increase. “As we see the rising costs of labour, it just makes sense,” the CEO said. Kiosks and other forms of automation are sweeping the fast-food industry. ORLANDO – American fast food chain Jack in the Box is considering swapping some cashiers with robots as the minimum wage rises in California. “As we see the rising costs of labour, it just makes sense” to consider adding new automated technology, CEO Leonard Comma said on Tuesday at the ICR Conference. Jack in the Box has previously tested technology like kiosks. According to Comma, the kiosks resulted in a higher average check and helped with efficiency. But, at the time, Comma said the cost of installing the kiosks wasn’t worth it. 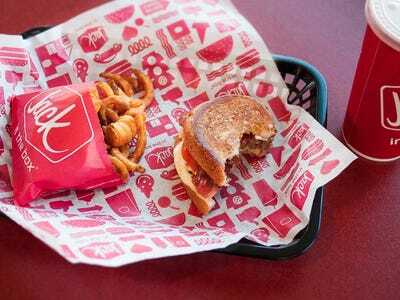 However, with minimum wages increasing, Jack in the Box is reconsidering the use of kiosks and other technology, Comma said. Minimum wages are increasing in 18 states in 2018, including California, where the West Coast-centric Jack in the Box is based. California is on track to become the first state with a $US15 minimum wage. Jack in the Box isn’t the only fast-food chain that has considered using automation in an attempt to reduce labour costs and modernise more generally. Wendy’s announced plans to install self-ordering kiosks within the year in 2017. McDonald’s is adding kiosks to 2,500 stores, though the company pledged not to replace cashiers with kiosks. Smaller chains such as Eatsa and CaliBurger have been working on automating the entire restaurant experience.